I have to confess, I haven't been feeling a lot of motivation lately to be productive. My free time is invariably consumed with net-surfing and the hours just insidiously creep by. Chores and errands are attended to with sloth-like urgency. I have occasional bursts of inspiration and energy, but they seem to be far and few between. I hope this phase ends soon! Luckily, the making of lazy meals has always come easily to me, and today's brunch idea is no exception. This is an accidentally vegan brunch that I cooked up one Friday, based on what I found at Simon's place. I guess in a way it's almost like a deconstructed guacamole, except I didn't have any red onion, nor coriander (aka cilantro to my North American readers). And I used lemon instead of lime, and dried chilli flakes instead of fresh, etcetera. You can keep these additional and alternative elements in mind if you make this. But I digress. Simple, yet full of flavour, this is an easy-to-prepare meal that highlights the natural goodness of the ingredients. chargrilled tomatoes on smashed avocado. Mix avocado flesh, lemon juice and garlic together in a bowl. Mash with a fork to your preferred consistency. A smooth puree can be good but I like some little chunks of avocado remaining here and there for this dish - it gives a nice textural element to it. Fire up the char-grill pan so that it's hot before you add the tomatoes. Toss tomatoes in olive oil, then place on the grill. I like to grill it on both sides and get them quite soft, but if you only do it one side, make it the cut-side down. I did mine on cut-side for about 5 minutes, then the rounded side for about 3 minutes, then back to the cut-side again for 1 minute. If you're doing a bit of flipping around, as I did, make sure the tomatoes, or the area of the grill they're placed on, remain well-oiled on subsequent flippings, so that the tomatoes don't stick on the grill. 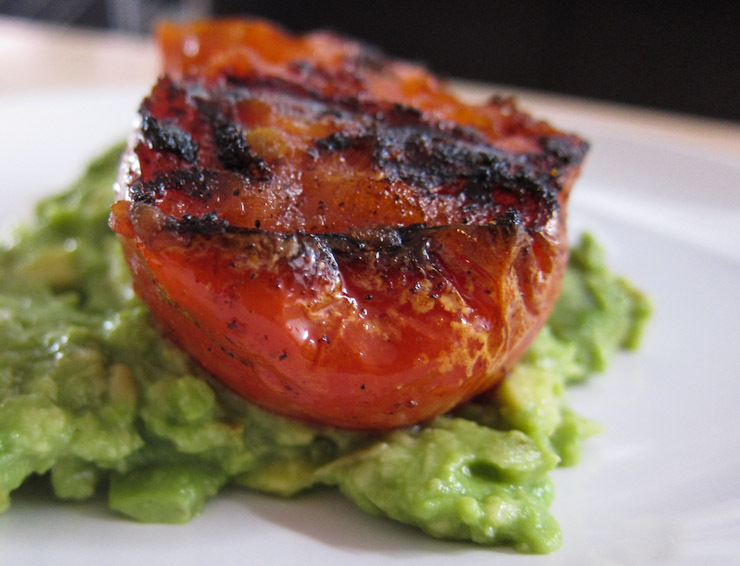 Swipe the smashed avocado onto a plate, and top with the chargrilled tomatoes. 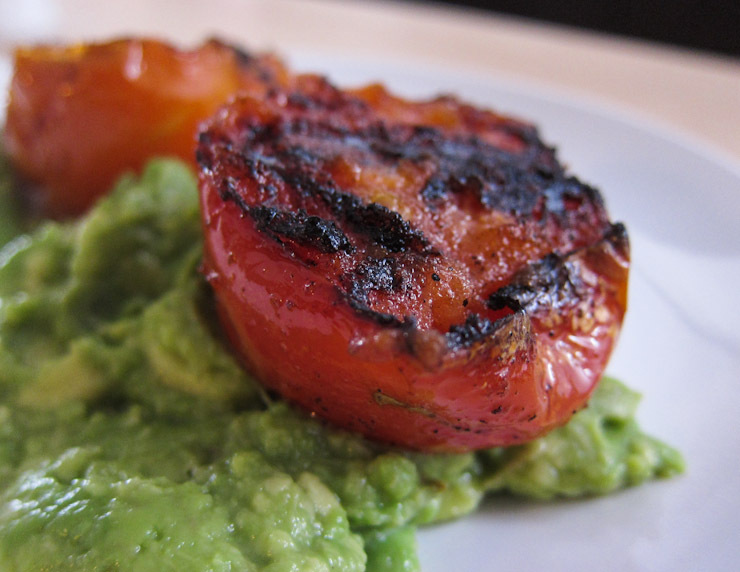 And there you go - hot, sizzling, juicy tomatoes on a bed of cool, creamy, smashed-up avocado. Tuck in. hot, sizzling, juicy tomatoes on a bed of cool, creamy, smashed-up avocado. Oh my gosh Leaf, this is such a freaky coincidence! My mum was just saying to me 2 days ago she wants to start adding grilled tomatoes to her breakfast and asked if I had any avo recipes to go with it. And we just went to buy some avo and tomatoes yesterday too. I'm going to show her this post later! Thanks for this! Looks really good - well done for making the most of what you found! I'd want some toast with it though. There's something about fried (or grilled!) tomatoes that I just love. The muffin idea sounds quite enticing! um, your first paragraph is also my life at the moment! i call it end-of-year-ennui... just want to finish work and have holidays. i would have that for my dinner (and emma's suggestion of an english muffin is such a good one); that's just the kind of girl i am. I know. I don't even have much in the way of holidays to look forward to, but gosh. So lazy. 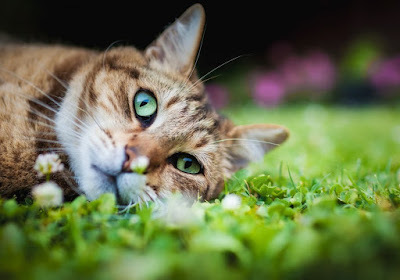 I think I'm just tired. And totally, it would work for dinner! I mix up my meals like that all the time. Smashed avocado is such a popular brunch item! The addition of a poached egg would be awesome. A slab of sour dough and I would eat this for every meal! Great recipe. Now I want it! I don't know about the lazy bit, this is my kind of eating = full of flavour, nutrients and good ol' fashion deliciousness! Such a simple and healthy looking dish, I keep seeing smashed avo on brunch menus, but it's interesting to note it's really not that hard to make. I have a strange thing about myself though, I usually avoid roasted or grilled tomatoes in my breakie dishes, to me, they taste metallic/slightly seafoody, lol! Much prefer if they come raw, like in a salad.